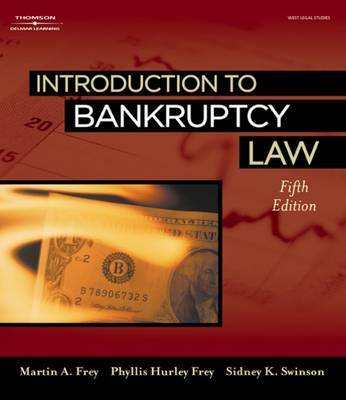 Introduction to Bankruptcy Law, fifth edition, is a perfect reference for practicing paralegals and attorneys as well as for paralegal courses in bankruptcy law. This new edition corresponds to the changes in bankruptcy law after enactment of the Bankruptcy Abuse Prevention and Consumer Protection Act of 2005 (BAPCPA). Material in this edition includes changes in the bankruptcy code and practice, new and revised official and procedural bankruptcy forms, revised bankruptcy rules, and bankruptcy cases that detail the case from initiation of the attorney/client relationship through the closing of the case. The book also includes new flow charts for each type of bankruptcy filing that emphasize the two tracks of bankruptcy; the administration of the bankruptcy estate and the debtor s desire to receive a discharge from as many debts as possible. Other key features are a brief history of bankruptcy law, research aids, alternatives to bankruptcy, a discussion of the role of the various parties involved in the bankruptcy process, and an overview concerning eligibility and the selection of the appropriate bankruptcy chapter under which the case should be filed. The book retains its step-by-step approach to each type of bankruptcy filing so the bankruptcy process is clear and understandable to the reader. Greater emphasis is placed on the paralegal s role in the fact gathering process and the interface with clients, and the concept-example-problem format of provides the opportunity for lively discussion.